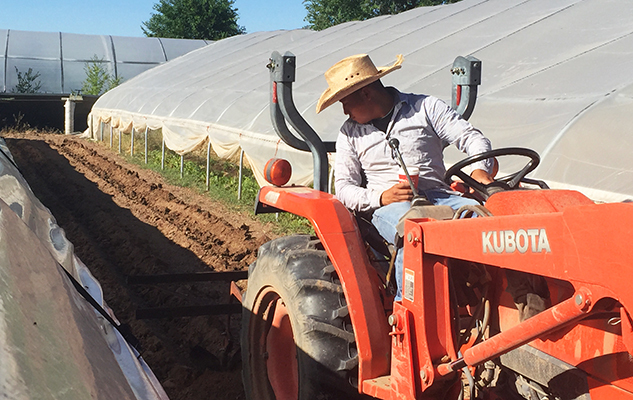 Nery Martínez, who is originally from Guatemala, has been farming with his uncle, Don Bustos, at Santa Cruz Farm & Greenhouses in Española, New Mexico for more than five years. Nery is one of four young farmers/ranchers from Colorado and New Mexico who are writing for NYFC about their experiences with water access. You can read Nery’s first post here. How does irrigation water reach your farm? Here in New Mexico we have a system of ditches or channels called an acequias. It’s a system—a really, really old system—that allows people to get irrigation water on their land. Don’s family has been farming here for over 400 years, and the acequias were already here when they started. Acequias don’t run in a straight line, they go through towns and communities. It’s like a little river. Our acequia is made of dirt, but there are some places that have a little bit of concrete because the dirt isn’t strong enough to retain the water. Acequias are unique—you share water? Yes. We share water. There is a community. It’s pretty cool. That’s how people stay connected, through their acequias. When there is enough water, I don’t hear about people fighting over water. But when there is limited water, a neighbor might tell you if you use too much water or ask you to share more. Where is your water coming from? Our water comes form the Santa Cruz River here in Española. It’s probably less than 10 miles away. But the river water starts out as snow in the mountains, and it goes into a reservoir before flowing into the river and then into our acequia. How is the water managed—how do you know how much you can use and when you can use it? There is a guy called the “mayordomo,” and he’s in charge of opening the main valve so that farmers can get water from the acequia. Sometimes we get water three days a week. Sometimes we get water two days. Sometimes the water is running every day. I’ve been here on this farm for about six years now, and usually the water comes on the last week of March or the first week of April and it is here until September or October, but not every day. Once the water is shut down, we don’t get water until next year. Farmers don’t get to decide when we can use the water, but sometimes we can ask for it if we really need it. We can call our mayordomo and say, “Hey, my crops are really dying. Is it possible to get some water?” I think the mayordomo is a good person and he wants to help. But there are rules that people need to respect, too, so there will be enough water for everyone. How are the acequias maintained? Every year, a month before they let the water run, people clean the acequia. We want to show that we care about the acequias, so we clean our section of the acequia that runs on the top of our property. We shovel, we cut weeds, we cut trees and everything that has grown up over the year. We leave the acequia really clean. There are also people who are paid to clean all the acequias. There are 10 guys who walk the whole acequia, and the mayordomo helps, too. It’s a whole thing that they do every year, and it takes a couple of weeks. And then when the acequia is ready and clean, then they open the main valve and the water starts running like a little river. 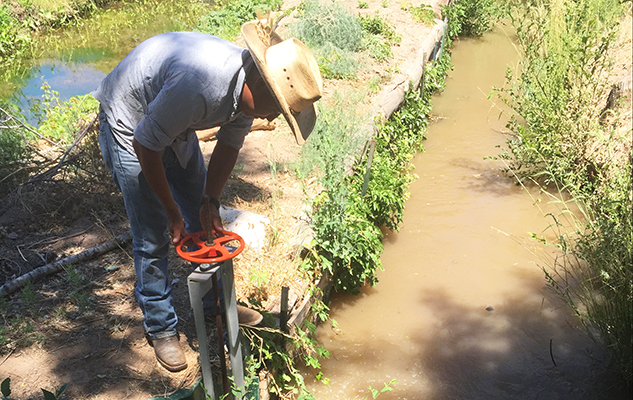 Is it hard to learn how to manage irrigation water and work with an acequia system? Yes. It was really a big challenge because in the beginning I didn’t know anything about farming. If you open the gate too far and bring in too much water, it can mess up the whole farm. It’s like a river going in a place that never has water, and it is going to cause erosion and wash away all of your good soil. Not only that, it will wash away your seeds. But if you don’t let enough water run, it’s going to take hours and hours and you’re never going to finish watering. So you have to kind of watch and see, and add as much water as you can while making sure that it’s not going to cause damage. Now that I know what I’m doing, it is a difficult task to delegate to other people. I want to say, “Hey, can you open the gauge of the acequias, so we can keep watering?” I’m pretty sure that I need to come and do it myself because if I let someone else do it they’re going to just open it a little bit, or they’re going to open all of it. Everyone can learn it, but it’s going to take time.